I remember there was a guy in Japan selling kits to install 1080p screens into an X220, however it pulled the signal or something like that from the docking station pins so that was a no go for me (need the docking station). I'm about to swap out a white spotted IPS LCD on my X220 but before I do I want to be sure there are no viable FHD options that don't mess with the docking station? I don't mind modding, as long as it doesn't interfere with a feature I need. The alternative is to use the signals on the DisplayPort on the left side of the X220, but I don't know if anyone's ever tried that. How many users are really interested in such mod? I'm working on it for myself ATM. P.S. : I use DisplayPort #2 on docking connector. Using mini DisplayPort for that purpose would be extremely difficult because in that case one should connect signal wires on both sides of the motherboard - that means custom ffc cables, interference issues and so on. nitrocaster wrote: How many users are really interested in such mod? I'm working on it for myself ATM. I'm very interested. I need to be able to dock my X220 but I do not need the display port working as I will be running an external GPU. Carthik wrote: I'm very interested. I need to be able to dock my X220 but I do not need the display port working as I will be running an external GPU. Barely possible due to the reasons described above. Anyway, with fhd mod that uses docking DP#2 you still can use two external monitors - just plug one into system DP instead of docking station. I'd be fine with that. Can you provide more details on your kit/parts? nitrocaster wrote: Can you provide more details on your kit/parts? I'll post once I get a working adapter. Last edited by nitrocaster on Thu May 19, 2016 3:27 pm, edited 1 time in total. I am also very interested in this. If you have time, could you write a bit more about what components you're buying / what you plan on doing specifically? I have very limited knowledge of electronics but would like to learn more. The main trick is backlight - there's no easy way to make it work properly. I'll post a little report with photos once the prototype is ready. Great. I am really looking forward to your updates! You may need an account inorder to view all pics, not hard by using chrome translate. Yeah, there were some successful attempts. However, it's still unclear if they got proper backlight control. That japanese guy (letsitbe.jugem.jp) sold some kits on japanese Yahoo auction for about $90 (adapter + cable). I've been trying to reach him with no success (among others) before I started my own project. At least in above case backlight control works perfectly just like original by using "Internal burner program"(quote from the author). Which proves there is a doable solution. Good luck with it. I am also attempting to fit a FHD dieplay into my X220. - Merged the original display cable with an eDP cable. Now the eDP gets backlight power and control, as well as logic power from the mainboard. The LVDS lanes and logic power are still also connected to the original display connector. -> I can connect both the old and the new display at the same time. The old one will show the image, but without backlight. The new one has backlight, with brighness control working! But of course there's no image there. - Tried to connect the eDP signal cables to the docking port. -> The new display was recognized by windows, but, when activated (in clone mode with the original), it showed no image. My conclusion: You can use the original backlight control if you can trick the Thinkpad to activate both LVDS and eDP in clone mode. StefanKo wrote: -> The new display was recognized by windows, but, when activated (in clone mode with the original), it showed no image. When dealing with high-speed interfaces, it's not only a shielding. In order to prevent signal loss, crosstalk and reflections you need a proper cable with matched impedance and length. For example, according to DisplayPort PCB layout guidelines, the length difference between a differential pair should be limited to 5 mils (0.127mm) maximum. Pretty tight, huh? StefanKo wrote: My conclusion: You can use the original backlight control if you can trick the Thinkpad to activate both LVDS and eDP in clone mode. The ideal solution would be to keep LVDS inferface inactive to reduce power consumption. Otherwise you'll basically have dual display setup working all the time. nitrocaster wrote: When dealing with high-speed interfaces, it's not only a shielding. In order to prevent signal loss, crosstalk and reflections you need a proper cable with matched impedance and length. For example, according to DisplayPort PCB layout guidelines, the length difference between a differential pair should be limited to 5 mils (0.127mm) maximum. Pretty tight, huh? I know there are strict guidelines. But I am also sure that you do not need to follow them so strictly all the time to get things working. nitrocaster wrote: The ideal solution would be to keep LVDS inferface inactive to reduce power consumption. Otherwise you'll basically have dual display setup working all the time. That is true, but as long as my display does not work, I do not intent to try to create my own pwm control for that display. Probably, even if it works, I'll just live with the higher power consumption. What is worse, is that the X220 can only control 2 screens at a time, so internal would always have to be off when using an external screen. I have further pursued my attempt on a FHD IPS X220, but so far I had no success. The FHD display never shows an image. The eDP lanes are connected to the docking port as shown in the images attached here. The cable lengths are approximately the same in each pair. I have tested the connections, they are really as in my schematics, without shortcuts or loose contacts. Unfortunately I currently have neither another eDP display to test, nor a notebook where I can test my current display. Any other ideas why it might not work? So far I got everything required to build a prototype... only to found that x240 LCD connector has reverse pin order. Due to a lack of solder paste I assembled the board using iron and hot air (sorry for bad focus, that's the only pic I got). Going to redesign the board, wait until it's manufactured and try again. Last edited by nitrocaster on Wed Jun 29, 2016 11:49 am, edited 1 time in total. While new pcbs are being manufactured, I made a successful attempt to install AUO B125HAN02 panel into the lid. This panel is somewhat larger than LP125WF2 models used in X240, so more material has to be removed. So now the only problem is backlight. that is incredible that you made your own board for this mod. i eagerly await when you finish this, i'd definitely buy it immediately. why didn't you use the board from china though? it seems that it fully works. Also, how much soldering is needed? 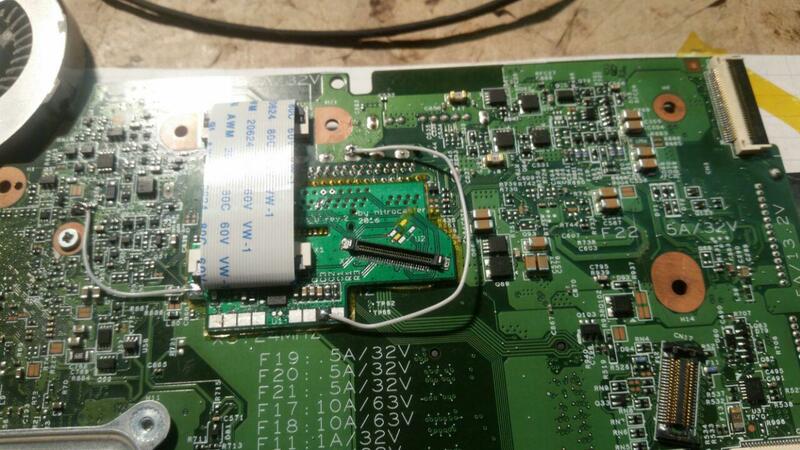 it seems like just two wires need to be soldered in, seems easy enough. choroq wrote: why didn't you use the board from china though? it seems that it fully works. Also, how much soldering is needed? it seems like just two wires need to be soldered in, seems easy enough. It's very difficult to buy. They sell adapter with lcd panel and refuse to sell the adapter itself. And you have to send the laptop to seller for the kit installation. Backlight is still not adjustable, but at least I can see the image on screen now. Something bad happened when I was installing the adapter board on my X230, and it doesn't turn on. Going to try troublesoot and repair it myself so that I could continue my experiments. Has anybody here upgraded a P71 FHD to UHD?